Better an egg this year than a chicken next year. 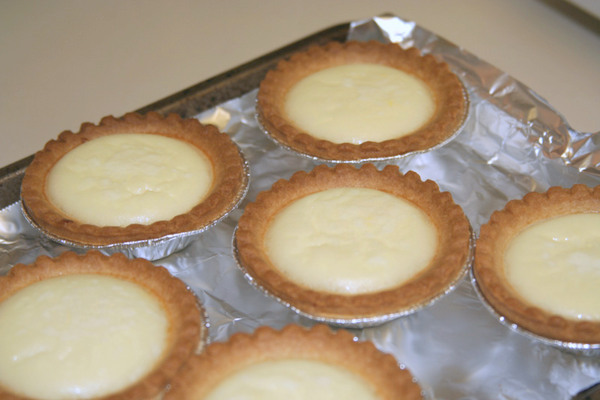 I made a small batch of Egg Custard Tarts. The boys love the tarts and can eat three at a go. This is a sure-fire way to get them snacking frequently. 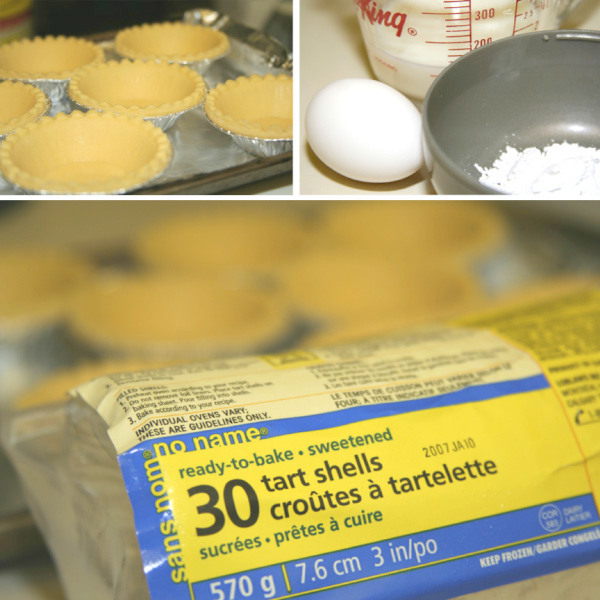 It takes about 35 minutes to make a small batch of eight tarts. If you like this recipe, you should also check out the recipe on Kuejadas (Portuguese Tart). This outlet is closed. Thai Son had re-opened along in Garden City. See entry here. It was cold and rainy today. Just the type of weather for a hot bowl of noodle soup. We went to the Thai Son Restaurant on No 3 Road. Is just across the road from the Richmond Centre. 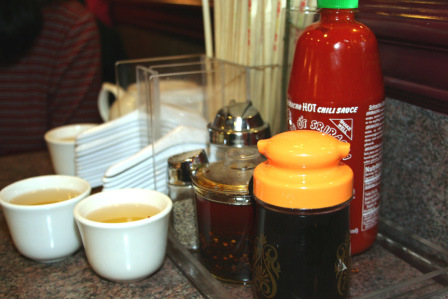 The Thai Son Restaurant is owned by a Vietnamese couple. 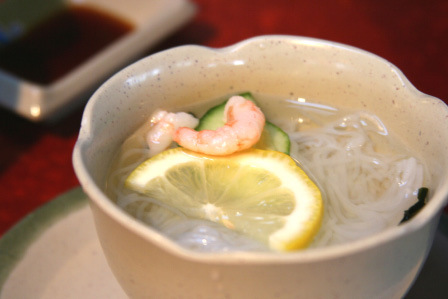 Although the name Thai Son appears to be a Thai restaurant, it is not … it is a purely Vietnamese restaurant. 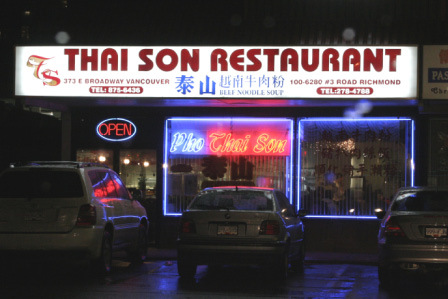 Thai Son has a restaurant too under the same name in East Broadway in Vancouver. Apparently, this restaurant was very popular back in the 1990’s among the Hong Konger crowd. There are a number of photos hanging on the wall of some old Hong Kong movie stars in the restaurant who emigrated to Vancouver prior to the 1997 handover to China. 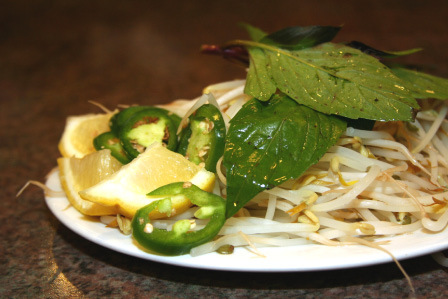 As in all Vietnamese restaurants, they always serve first the complementary bean sprout. Thai Son serves the bean sprouts blanched and warm. 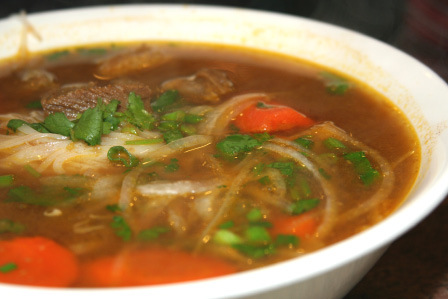 Suanne ordered the Rice Noodle in Special Vietnamese Stew. The stew was not thick and the beef chunks were tender. Nanzaro shared this with his mum. We stayed in and watched the closing ceremony of the Turin Olympics and did not go out for lunch as we normally do on the weekends. 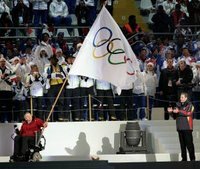 We were actually more interested in the 8 minutes segment of the Vancouver’s “Come Play With Us” presentation and seeing our mayor receive the Olympic flag — don’t you think it’s cool having none other than Sam Sullivan receiving it. I think it speaks volume of what Vancouver is about. We are all pretty excited about the Olympics coming to Vancouver in 2010. This box of pizza must have been in our freezer for about, what, 4 weeks? We bought it but never got down to baking it. 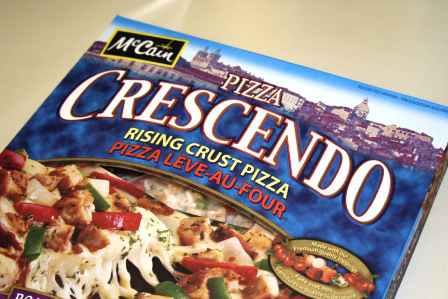 The pizza we made today is the Crescendo Rising Crust Pizza brand with the Roasted Chicken Deluxe flavour. The pizza was layered with with rich mozzarella cheese, lots of it. The chunks of chicken pieces were quite big too. 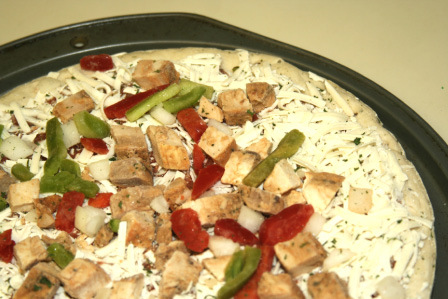 Other toppings were onions and green and red peppers. You can either bake the pizza to a soft crust or crisp crust. We always prefer the crispy crust. The baking took about 20 minutes in the oven. To me, the best part of the pizza is the crispy and crunchy crust. Small meal but just great for an afternoon in front of the TV. Updated 17th Jan 2011: This restaurant had been closed according to Urbanspoon.com. It’s been a while since we had sushi and the boys wanted sushi for lunch too. Suanne also wanted to try the Top Gun Sushi I went to a few weeks ago. So, we made our way to the Top Gun Sushi at the New West Quay. The all-you-can-eat is more expensive on the weekends. It costs about $11 for adults and $7 for kids age 6-9. He he he … the waiters thought the boys were below 9 years and we kept quiet … don’t ask, don’t tell, right? 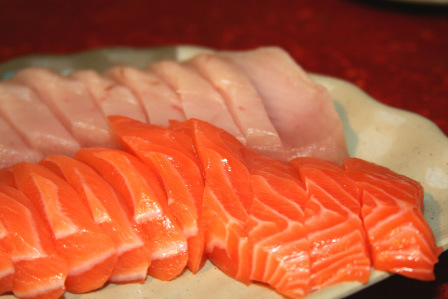 All-you-can-eat Shashimi is $2 extra for adults. Arkensen can just eat shashimi alone. We ordered 28 pieces in all. The pieces are small but rather fresh. Suanne started off with cold noodles from the salad bar. I don’t know what that means when Suanne said they were “refreshing”. 🙂 It’s had a bit of lemon and is sourish. When the big fish fight the shrimps must lie low. The Richmond Community Kitchen, coincidentally, showed Korean BBQ beef for the session this week. The lesson today was led by Tanni Lee. I like Tanni because she is soooo cheerful and have a smile all the time for everyone. Tanni made two separate dishes that complements each other. The Korean Style BBQ Beef goes very well with the dried shrimp pancake. For garnishing, she used kiwi fruit. 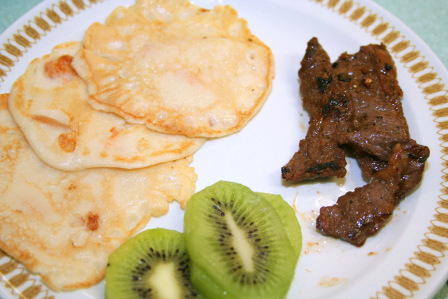 She also used the kiwi fruit juice to marinate and tenderize the beef. 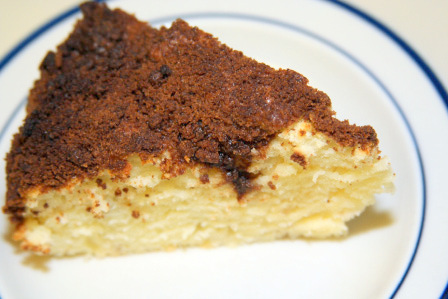 I made a Sour Cream Coffee Cake before I went over to Allie’s for her Bulgogi lunch. It has been a while since I made this cake. Since I still have a cup of sour cream in the fridge, I thought I should use it. This goes well with coffee. 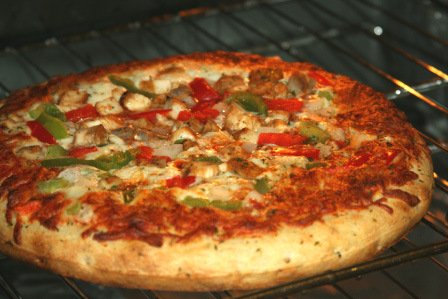 Heat the oven to 350F and grease a 6-cup tube pan. 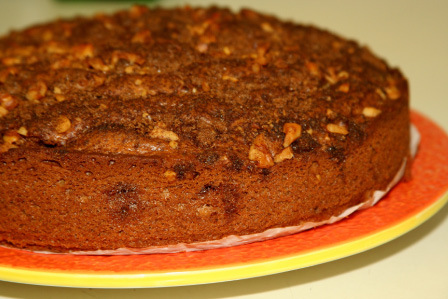 Mix walnuts, brown sugar, and cinnamon to make topping and set aside. Stir or sift flour with baking powder, baking soda, and salt until dry ingredients are well combined. 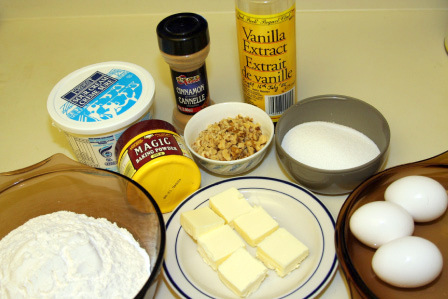 Cream the butter with the sugar until the mixture is light, then beat in the eggs and vanilla. Add the flour mixture in alternate thirds with the sour cream,beating well after each addition. Spoon half the batter into the pan and sprinkle with half the topping, then add remaining batter and sprinkle on the rest of the topping. Bake for 40 minutes without opening the oven, then test for doneness (a toothpick should come out clean). It may need another 5 to 10 minutes of baking. 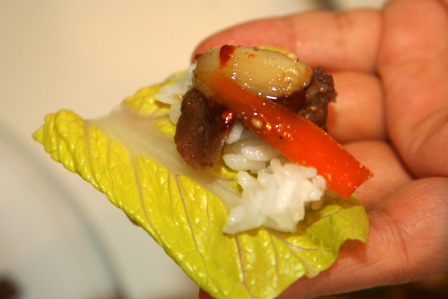 Bulgogi is a popular Korean beef dish, a kind of Korean barbecue. It is made from marinated steak that is cut into thin strips before cooking. 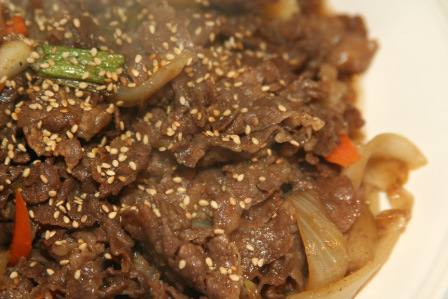 Bulgogi is a specialty dish served when guests visit or eaten in restaurants. The dish is also often served to non-Koreans as a first taste of Korean cuisine. Instead of barbequing it, Allie pan fried the sliced beef strips. She pan fried it with lots of slices onions, green onions and garlic. The cooking smelt good. I have money, you have money; so we are friends. Panos came over to play with Arkensen and Nanzaro the other day. Panos is Norm’s best friend. Since Panos wanted to stay over for dinner and I thought I make instant noodles for the boys. 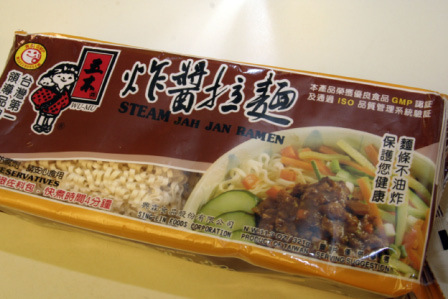 Unlike most other single serving packets of instant noodles, the Steam Jah Jan Ramen comes in a pack for servings of four. This is just the right size for a quick lunch for our whole family. Opening it up, it’s just like any other noodles with a twin packets of seasonings. The first packet was the oil and other other is the “jah jan”. 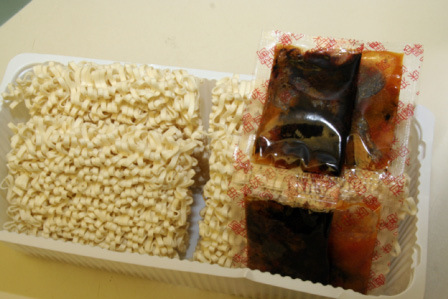 Jah Jan is basically made of fried pork fats, lean pork and soy bean paste. We found the instructions on the wrapping funny. It’s common to see broken English used in Made in China products. 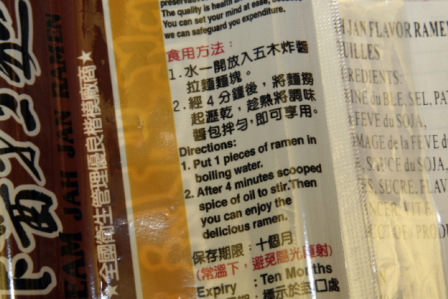 The instructions reads “After 4 minutes scooped spice of oil to stir. Then you can enjoy the delicious ramen”. 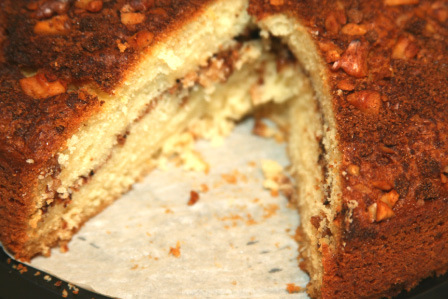 I made Cinnamon Coffee Cake today. I normally make cakes at least once a week for breakfast and snacks for the boys. Ben likes cakes with coffee in the mornings too. It goes very well with coffee. Cinnamon is a small evergreen tree 10-15 m tall native to Sri Lanka and Southern India. The bark is widely used as a spice. It is principally employed in cookery as a condiment and flavouring material, being largely used in the preparation of some kinds of desserts, chocolate and spicy candies and liqueurs. In the Middle East, it is often used in savory dishes of chicken and lamb. In North America, cinnamon and sugar are often used to flavor cereals and fruits, especially apples. 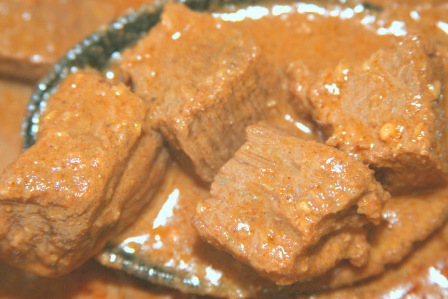 Rendang is a dish from Malaysia which in some ways resembles a purely meat curry. In Malaysia, it is prepared by the Malay community during festive occasions. Rendang is often served with a ketupat (a compressed rice cake) and lemang (glutinous rice barbecued in bamboo tubes). 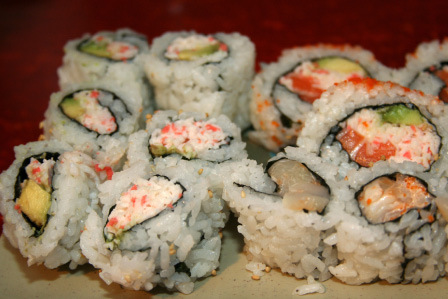 However, it goes equally as great with steamed rice, or even bread. It is not very spicy hot but is very heavily flavoured in spices. 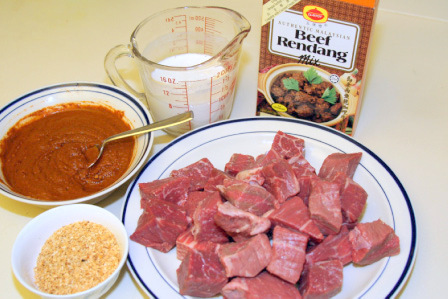 Rendang is normally made from beef (or occasionally chicken or mutton) slowly cooked in coconut milk and spices for several hours until almost all the liquid is gone, leaving the meat coated in the spicy condiments. The spices may include ginger, galangal, turmeric, lemon grass and chillies. 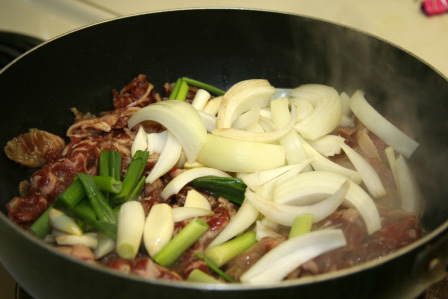 The slow cooking process allows the meat to absorb all the spices and to become tender. That sounds daunting, right? Things are much more easier these days because we can just buy all the ingredients mixed in a box.